About 50 people turned out Thursday night to learn more about the options being considered to renovate or replace Penn Manor High School. Attendees at the March 17 High School Master Plan presentation had many thoughtful questions about the four renovation/construction options being considered for the school. Penn Manor school board is considering projects ranging from a $52 million renovation of the existing facility to a $100 million new school. Originally built in the 1950s and partially renovated in the mid-1990s, the high school is experiencing deterioration and major component failures, and improvements are need to adequately meet current and future educational needs. The next public meeting is scheduled for 7 p.m. April 21 in the high school auditorium. The school board will discuss the master plan options at board meetings on May 16 and June 6 and is scheduled to vote on which option to pursue at its June 20 board meeting. Construction would not begin until 2019, at the earliest. Information on the project also is available on Facebook page Penn Manor HS Project. This project is a major undertaking that will impact district programs and finances for years to come, so your input is crucial. Please participate! Congratulations to the five Penn Manor school board members who were sworn in Monday by District Judge Joshua Keller. Joe Fullerton, Ken Long, Donna Wert, Carlton Rintz and Jeffrey Lyon each won a four-year seat in the November election. Lyon replaces Kirk Schlotzhauer, who decided not to run for re-election. The four others were re-elected to new terms. Lyon is no stranger to Penn Manor school board, having served from 2001 to 2007. Also at Monday’s meeting, Long was named president and Rintz was named vice president of the board. In addition, Long, Rintz and board member Johnna Friedman received commendations for their years of service. Friedman and Rintz have served for 12 years, and Long has been a member for eight years. 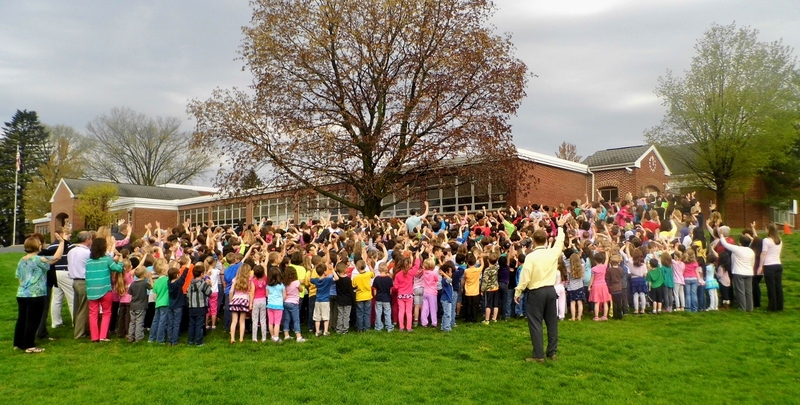 Thank you, for your voluntary service to the students, staff and families of Penn Manor School District! Penn Manor School District this week completed the sale of the former Hambright Elementary School to Signature Senior Living LLC for approximately $1.5 million. 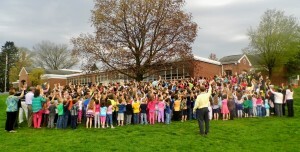 The sale marks the end of the school’s 80-year existence, said superintendent Mike Leichliter. “While many students and teachers have fond memories of the old building, the school district is pleased that the property will be used by a taxpaying entity and that the proceeds can be used to offset other capital expenses of the district,” he said. The former school was shuttered after the 2013-2014 school year and was replaced by a new Hambright Elementary School on Charlestown Road that opened in August 2014. Signature Senior Living plans to tear down the building and construct an 80-unit memory care and assisted living facility on the site, located at 2121 Temple Ave.
Students and staff bid farewell to Hambright in 2014. Penn Manor School Board members honored Kirk Schlotzhauer for his eight years of service to the board during his final meeting Monday night. Schlotzhauer, who joined the board in 2007, chose not to run for another four-year term in the November election. He will be replaced next month by Jeffrey Lyon, who successfully ran for Schlotzhauer’s open seat. As a parting gift, Schlotzhauer also received a giant chocolate chip cookie, signed in icing by his eight fellow board members. 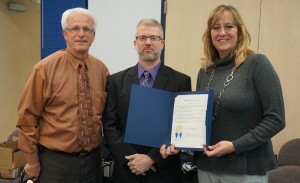 Thanks, Kirk, for all your hard work on behalf of Penn Manor and its students! Nearly 90 people turned out for the first public information meeting on the future of Penn Manor High School, held Thursday night in the high school auditorium. District residents and staff members heard about the four options Penn Manor School Board is considering to upgrade and/or renovate the school, which was originally built in the late 1950s and renovated beginning in 1994. The school board is considering a range of projects, from a basic renovation to construction of a new school, and is seeking the public’s input. Thursday’s meeting was the first of nine sessions, and participants had plenty of great questions and thoughtful comments. If you missed the meeting, your next opportunity is Nov. 18 in the Penn Manor High School cafeteria. Penn Manor also has set up a web page that contains links to the PowerPoint presentation on the high school master plan, the full schedule of meetings and a summary of the four options, a survey about the four projects, and a Facebook page on project developments. You can access those resources here. Thanks to all those who turned out Thursday! You are invited to participate in an important meeting on the future of Penn Manor High School. On Thursday, Oct. 22, the district will hold the first of several public presentations on renovating or replacing the school. The meeting will begin at 7 p.m. in the high school auditorium. Built in the 1950s and partially renovated beginning in 1994, the high school is experiencing deterioration and major component failures that must be addressed to adequately meet current and future educational needs. Penn Manor School Board is considering four renovation/construction options and is seeking public input on how to proceed. Nine public meetings are planned on this important issue. Below is a flyer listing the four options to be considered, along with a schedule of upcoming meetings. The school board expects to decide on an option at the end of the 2015-16 school year, but work would not begin until the summer of 2019, at the earliest. You can follow the latest developments on the project on Facebook by clicking here to access the “Penn Manor HS Project” page. This is a major undertaking that will have an impact on district programs and finances for years to come, so your input is crucial. Please participate! Penn Manor school board Monday honored Victoria Herr, a 2014 graduate of Penn Manor High School, for serving as FFA State Secretary this year. The board formally commended Herr, who joined six other FFA officers to represent the organization at events across Pennsylvania in 2014-15. Victoria told school board members she participated in leadership workshops and other activities at 29 high schools across the state. 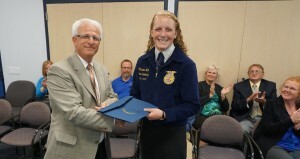 She thanked the board for its support of Penn Manor’s agricultural education program, which includes four teachers and enrolls about 250 students in programs that include veterinary science, horticulture, biotechnology, agriculture mechanics and food and natural resources. Last year, the PMHS program was named the Outstanding Secondary Program in Pennsylvania. Herr delayed her first year of college to serve as state secretary, an unpaid position. 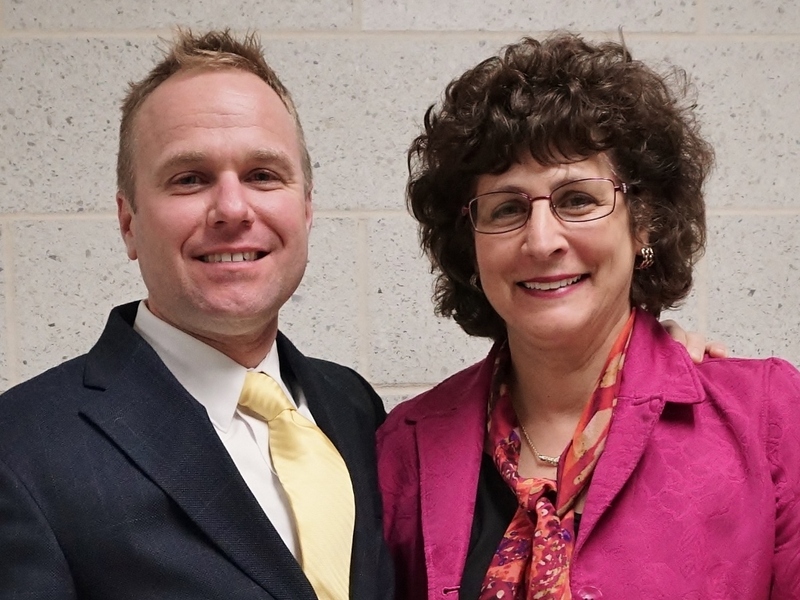 Her appointment marked the first time in nearly a decade that a Penn Manor student or graduate had achieved such an honor. Also at Monday’s school board meeting, Victoria was presented with the Joseph Kurjiaka Memorial Scholarship, a $2,000 award toward her education at Penn State University beginning in the fall. The award is in honor of Kurjiaka, a Hempfield school board member and Manheim Township School District chief financial officer who passed away in 2011. Penn Manor school board president Ken Long presents Victoria Herr with a commendation at the May 4 school board meeting as her family members look on. 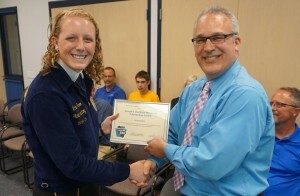 Victoria Herr receives the Joseph F. Kurjiaka Memorial Scholarship Award from Penn Manor business manager Chris Johnston. She will delay the start of her college studies to serve as secretary during the ’14-15 year. 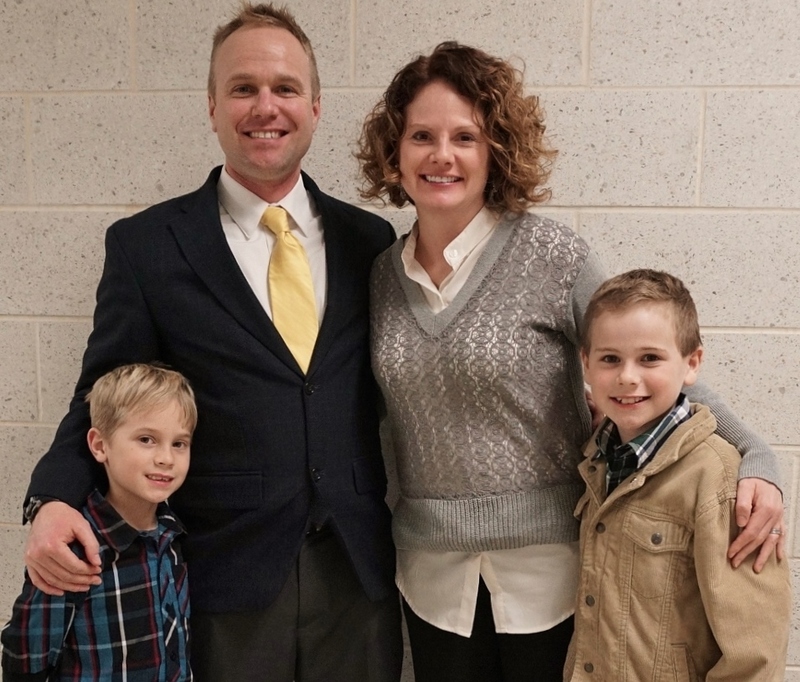 Congratulations to Dr. Jerry Egan, whose appointment as Penn Manor assistant superintendent for elementary education was approved Tuesday night by the school board. Egan will replace Vickie Hallock, supervisor of elementary education, when she retires June 30 after 25 years with Penn Manor. In his new role, Egan will oversee curriculum and operations of the district’s seven elementary schools. Egan has been a teacher and administrator in Penn Manor since 1999. He has served as an elementary and middle school teacher, Twilight Program alternative education instructor, middle school assistant principal and elementary principal. Since August 2006, he has been principal of Hambright Elementary School. Egan and his wife, Pam, a kindergarten teacher at Letort Elementary School, are Penn Manor residents. Their sons, Gavin and Chace, attend Eshleman Elementary School. Best wishes, Jerry, on your new role in Penn Manor! Dr. Jerry Egan with his wife, Pam, and sons Chace, left, and Gavin. Penn Manor school board has approved the district calendar for the 2015-2016 school year. The first day of school for students will be Wednesday, August 26. The last day for students is scheduled for June 8, 2016. Four weather make-up days are included in the calendar. Penn Manor School District will hold an Act 34 meeting on the proposed Pequea Elementary School renovation and addition project at 5 p.m. March 2, 2015, in the auditorium of Manor Middle School, 2950 Charlestown Road. The meeting will include a project description, along with presentations on the educational, physical, administrative, budgetary and fiscal aspects of the project, which is scheduled to begin next school year. The proposed improvements include enlarging and brightening the school’s entrance and lobby, relocating the stage, enlarging the kitchen, adding two academic commons spaces for classroom groups and modifying bus and car access points outside the building. In addition, mechanical, plumbing, heating, air conditioning and lighting systems will be replaced, and the building’s exterior will be upgraded. Penn Manor school board members will attend the Act 34 meeting, along with representatives of the district administration, architects Crabtree, Rohrbaugh & Associates, financial advisers RBC Capital Markets Corp. and district solicitor Kegel, Kelin, Almy & Lord. The public will have the opportunity to comment on the project at the meeting. Penn Manor School District is asking members of the community to participate in an online survey regarding the performance of superintendent Dr. Mike Leichliter. The survey will provide valuable feedback for Penn Manor school board members and the superintendent and give members of the public an opportunity to share their impressions of Penn Manor School District. The Survey Monkey tool is easy to use and includes an open-response area that enables participants to communicate directly with all nine school board members and the superintendent. Responses are anonymous. The survey will close on Wednesday, February 18. Please participate by clicking here.